Have you been called ‘R*TARDED’? Did you like it? Even if it’s just a joke, you deserve to be Respected. 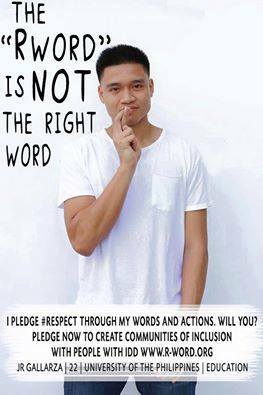 ‘R’ word should be stopped now! Support #EndtheRWord campaign by sharing this or posting a photo of yourself (or with friends) just like the #JRGallarza way!